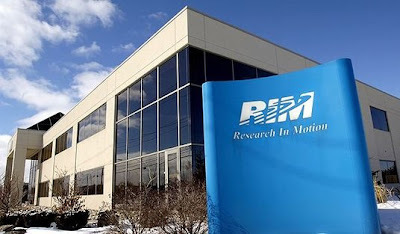 RIM beat Wall Street estimates with their Q2 results, sending their stock soaring by nearly 20%. RIM boosted its revenue & cash position, while cutting losses from the previous quarter. Let's take a look at a few other metrics and take a brief look at the company's future prospects. 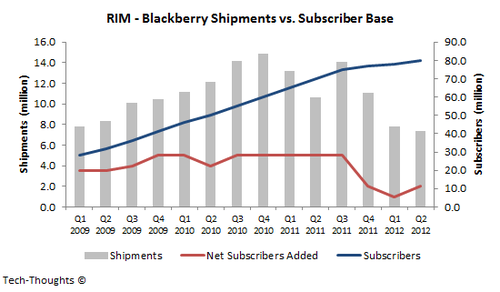 RIM's quarterly shipments declined to 7.4 million, the lowest level since 2008, but its subscriber base grew to 80 million. The pace of subscriber addition grew from 1 million in Q1 to 2 million. However, this is still the second lowest level when compared recent quarters. Based on feedback from corporate customers & carriers, it is fairly safe to say that this growth has primarily been driven by the consumer segment in emerging markets like India & South East Asia thanks to the popularity of its Blackberry Messenger client. But RIM may soon face a threat from an unlikely source. Popular cross-platform messaging client, Whatsapp, has been busy sewing up deals with carriers in Asia to offer messaging services at rock bottom prices. As Whatsapp's relationships grow, RIM should face considerable pricing pressure on the messaging front and restrict subscriber addition in these markets. While RIM grew the average selling prices of its devices for the first time since Q3 of last year, it is still at its second lowest level since 2008. Interestingly, the gross margin has continued to decline while the ASP has increased over the last quarter, hinting at continuing inventory issues. The market is going to get tougher and even more challenging with new products hitting the market. We are expecting price pressure in order to keep our relevance in the market. RIM should face continued ASP and margin erosion over the next few quarters. However, RIM's better than expected Q2 results could potentially make it a more palatable acquisition target, before the release of Blackberry 10. Once Blackberry 10 hits the market, I think that opportunity may be lost. While Thorsten Heins seems to think they have a shot to be the "third platform", that may be overly optimistic given the competitive dynamics between platforms in developed & emerging markets. Do you mostly create only for your blog or you do that for any other Internet portals?